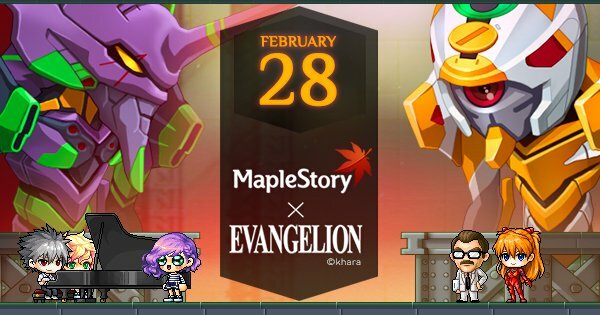 Nexon America announced that MapleStory will host a crossover event featuring iconic Evangelion anime movies from February 28th to March 27th. You will have the opportunity to interact with the heroes of Evangelion and participate in various quests and events with them. MapleStory is a page scooter MMORPG where epic adventures and good friends await players as they set out to stop the sinister Black Mage from terrorizing Maple World. With over 40 unique classes, nearly unlimited cosmetic options, and hundreds of hours of gameplay, players will overcome dangerous dungeons as part of their never-ending MapleStory. Primarily, you have the task to help the Evangelion heroes in Maple World. They are disoriented because Maple World is a new environment for them. You'll need to help them get familiar with the game world and go through daily quests. You will meet Shinji, Rei and Asuka and earn EVA coins. You can only spend them on items for a limited time. The invasion waves of Angel opponents pose a great threat. You must fight them to save Maple World. Evangelion Coin Shop - After completing the Evangelion events and quests, players earn EVA coins that they can exchange for temporary items such as chairs, medals and even permanent equips. Evangelion Style Boxes - For a limited time, special surprise chests are available that include accessories and outfits to customize the MapleStory Evangelion-style characters. Exclusive Items - In addition, it is possible to purchase special random boxes containing Evangelion items such as androids, or buy hair coupons to make your characters look exactly like the ones from Evangelion.